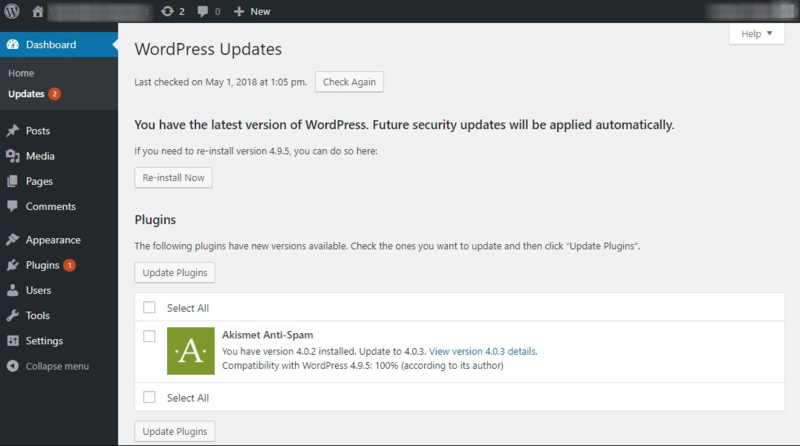 Keeping your WordPress installation up-to-date is plays a vital role in maintaining your site's security. Most updates just fixes bugs and adds features, but any other updates are highly regarding security updates which are highly recommended to run. To update your WordPress installation login and visit the administration dashboard. On the left you will see a 'Updates' tab, when there are updates available you will see a orange badge indicating that there are updates waiting for you. Note: We really recommend you backup your installation/database before upgrading. If anything fails, you cannot revert back that easily. Note: If you are using OPCache, it might be that WordPress keeps telling you there are updates. You will have to flush the PHP-FPM worker so changes come through.